Topeka, Kan. — The Kansas Bar Foundation (KBF) is pleased to welcome CoreFirst Bank & Trust as the founding member of the new “Partners in Justice” program. This honor roll program is designed to provide banks an opportunity to pay supportive interest rates on “Interest on Lawyers’ Trust Accounts (IOLTA).” Interest on IOLTA accounts is collected by the KBF and awarded through a granting process to organizations that support access to justice for low-income Kansans. Banks are also asked to agree to waive fees, so even more funding can be generated to support these programs. Hon. 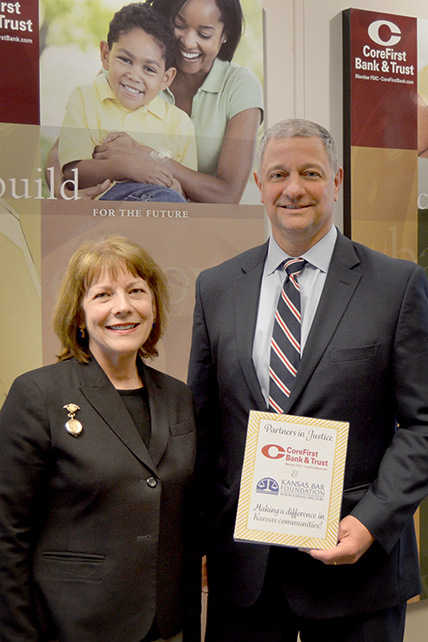 Evelyn Z. Wilson, President, Kansas Bar Foundation and Kurt Kuta, President and CEO, CoreFirst Bank & Trust. In fact, most banks throughout the U.S. routinely waive fees on IOLTA accounts in support of IOLTA’s charitable purpose. Partners in Justice banks go one step further by agreeing to pay at least 70% of the maximum value of the Federal Funds Target Rate range (with a minimum of 0.7%) on all IOLTA deposits. The amount of IOLTA grant funds available depends on interest rates paid on the accounts. When rates drop and stay low, as they have from the beginning of 2008 to 2017, IOLTA funding declines. Many IOLTA programs throughout the country have been forced to reduce grants to legal aid providers, in many cases by large percentages. Partners in Justice banks will help address this shortfall in Kansas. The banking community benefits, because they place a high emphasis on reinvesting in communities. It is a win-win formula that benefits low-income Kansans. 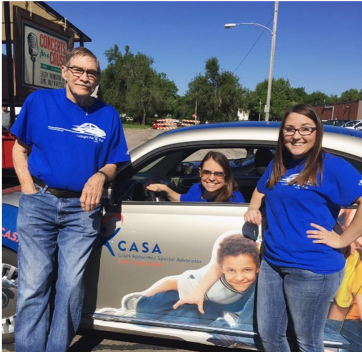 Sandra Bradley, Executive Director, CASA: A Voice for Children, Inc., (District 9 office) enjoys a ride in the CASA Bug with two staff members from her program. The Bug was driven in the McPherson County All Schools Day. parade. CASA photos courtesy of Kansas CASA. “CoreFirst Bank & Trust has participated in the IOLTA program since 1985. We proudly support the Kansas Bar Foundation’s mission of awarding grants to organizations that provide justice and legal education. The Partners in Justice program gives us the ability to provide extra funding so families in need can get the judicial access and support they deserve and don’t always receive,” stated Kurt Kuta, President & CEO, CoreFirst Bank & Trust. committee, with members from the legal community, the Court, government, and the banking profession, determines the next year’s grant recipients. “The IOLTA program promotes access to legal services to various underserved groups for whom necessary legal services are not readily available. The Kansas Bar Foundation values the commitment to IOLTA made by CoreFirst, our very first Partner in Justice,” explained Susan G. Saidian, KBF Secretary-Treasurer and past chair of the KBF IOLTA Committee. IOLTA funding provides training for CASA volunteers who make a difference in the lives of Kansas children. Mickey Edwards, State Director of Kansas CASA, stated that the timing of this partnership comes at a time of growing needs for children in the court system. The Partners in Justice program is available for all Kansas financial institutions in the IOLTA program. CoreFirst Bank & Trust has been a long-term financial partner with the KBF and is well suited to launch this program.